The Skagit River Atlatl. Image © UBC Museum of Anthropology, Photographed by Derek Tan. CC Licenced. Made of yew, a hard yet flexible wood, the weapon survived 1,700 years buried in alluvium in the Skagit estuary until it was dredged from these silts by a seine fisher’s net in 1939 in the Lower Skagit between Townhead Island and Bald Head Island. It is believed that it hung in a fish shed, perhaps to dry slowly thus preventing some deterioration, until archaeologists became aware of it in the 1950’s. Rather incongruously, the Southwest Archaeology blog Gambler’s House has had two in-depth posts about this artifact, here and here. It’s worth reading both as they give excellent background and tons of links. Side view of Skagit River Atlatl. Image © UBC Museum of Anthropology, Photographed by Derek Tan. CC Licenced. 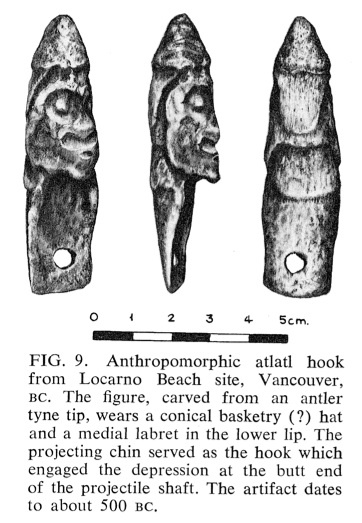 According to Margaret Holm’s 1990 analysis of Northwest Coast archaeological art, the Skagit atlatl exhibits the most elaborate and detailed design of any ancient object yet found in the region. Although the artistry appears at first glance to stand apart, Holm’s analysis of individual design elements shows connections to other carved art works from this time period across the region and affinity with characteristic elements in historic Salish art exemplified by spindle whorls. The most prominent feature of the atlatl is the magnificent and expressive feather-crested lightning snake that surmounts a human head and appears determined to propel itself forward in its task. Lightening snakes are associated with sea mammal hunting in Salish cosmology. As noted in a previous post here, atlatls were highly effective maritime weapons, especially for use in canoes and kayaks where, as opposed to a bow and arrow, they could be operated with one hand only. This would indeed make them highly suitable for marine mammal hunting, since they can as readily throw a harpoon as a spear. As Gambler’s House points out, there is also an informed discussion happening on the atlatl thrower discussion boards here, although Borden, “Father of BC Archaeology”, is characterized by one poster as a “pinhead”. The text accompanying the MOA pictures is also informative, and one day soon I’ll make a post about their slick new website. And, for completeness, see Grant Keddie’s paper on atlatls and atlatl weights in the Northwest, downloadable here – it gives a good account of atlatl use as well as images of the characteristics stones which may have been used to balance the tool. Ca. 2500 year old atlatl hook. Source: Borden, 1968. This entry was posted in Archaeology, Northwest Coast, underwater archaeology, Washington State and tagged art, atlatl, Salish, Salish Sea, Skagit, Swinomish, weapons. Bookmark the permalink. The atlatl hook shown here is described by Charles Borden as a person wearing a labret or lip plug. I have examined this artifact carefully and have concluded that there is no labret. What is referred to as a labret is actually the mouth. The grooved out area below the nose is to emphasize the nose – it is not a mouth. The Skagit River atlatl is currently on view at the Museum of Anthropology in the Multiversity Galleries: Ways of Knowing in Case 7.